My first impression of this toy wasn't a good one. I couldn't help thinking it just looked like a blob of rather badly shaped plastic... However, once you take it out of the box and do a little simple construction, this is quite an impressive toy. The Parallax figure can be rolled across the floor, which causes its two tentacles to move up and down. But the best thing about this toy is that when you grab the two segments of its tail and squeeze them together its belly opens and a giant arm reaches forward and grabs at anything in its path. So, if you roll the Parallax up to a Green Lantern figure (one of which is included) then you can grab the figure and capture it inside the Parallax's body. 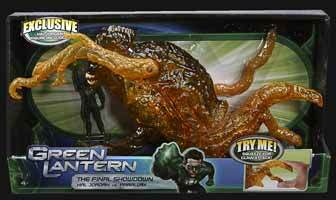 Then if you open it's stomach again it spits the Green Lantern figure out. As I mentioned before a 4" Green Lantern figure is also include. However it only has joints in the shoulders and head. There's a slight amount of construction that you'll have to undertake before you can play with this. You'll have to connect the two tentacle extensions and the right hand side of the chest flap also has to be attached, but there are instructions included and it's not difficult to set up. 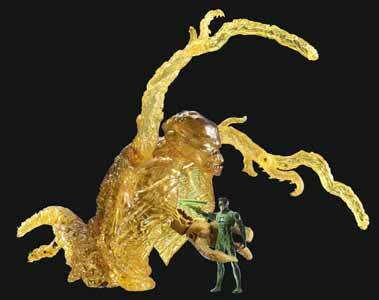 Young fans of Green Lantern will enjoy this, but it's not quite detailed enough to appeal to older toy collectors.